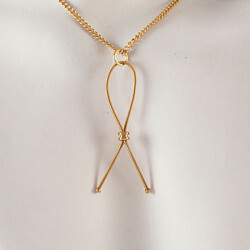 Paul Rodgers Guitar String Awareness ribbon pendant made out of Paul Rodgers’s donated guitar strings, by jeweler and 2x breast cancer survivor Elisa Guida. Pendant is app. 2″ and comes with a 16″ or 18″ gold colored chain. This piece is made to order and takes approximately 4-5 weeks to complete. These pieces are hand made and vary slightly.